Diehl, M.B.A., pose with students taking The Money Thing course this spring. It's not uncommon for college students — and graduates — to make major money mistakes. That's why Professor of Economics and Finance Angela Isaac, Ph.D., and Nelson Chipman, M.F.A., executive director of Point Park Online, created a course called The Money Thing, which educates and encourages students to make smart financial decisions during and after college. 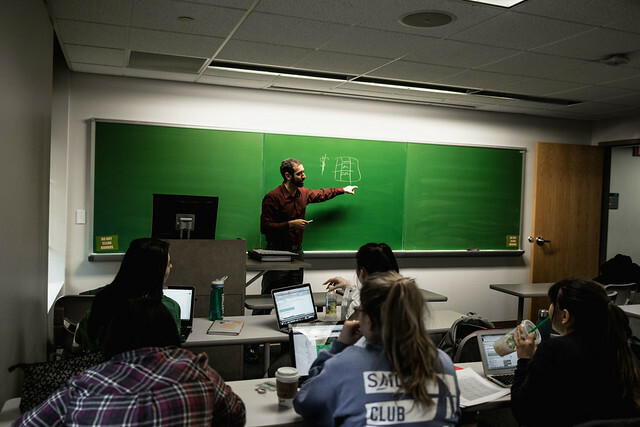 The course, which fulfills the "Succeed in Business" requirement in the University's core curriculum, is offered both on campus and online this summer. More than 100 students across all undergraduate majors have enrolled in the course since it launched this past fall. Isaac teaches the business management course, along with School of Business Instructors Joseph DeFazio, CRPC, Ph.D., associate financial planner for Pittsburgh Financial Planners, and David Diehl, M.B.A., vice president and corporate and institutional banking risk manager for PNC. "We provide students with an engaging and approachable framework for developing greater financial literacy while helping them to create financial plans as they transition from college to the real world," Isaac explained. Topics covered in The Money Thing course range from student loan consolidation, balancing consumer needs and savings to financial budgeting and planning, establishing and maintaining a healthy credit score and developing long-term financial horizons. Students also investigate PC and mobile applications available to support their financial needs, Isaac said. Additionally, the course features guest speakers from the University's Career Development Center and Student Accounts department, as well as industry professionals from national banks and law firms in Pittsburgh. "I decided to take this course because it sounded so interesting and unique. My Student Success Center advisor, Judy Chanyi, told me that this class would teach me how to successfully handle my personal finances and I couldn't pass that opportunity up," said Amedea Baldoni, a sophomore political science and legal studies double major from Riverview High School in Verona, Pa., and a native of Rome, Italy. Meghan Macioce, a sophomore broadcast reporting major from Franklin Regional High School in Murrysville, Pa., said: "Professor DeFazio taught us how to be successful for our financial future. I learned which areas to invest in at different stages of my life. Car insurance, house insurance, life insurance, college loans and more were covered, but retirement is the one that really stuck out to me." "Through my major classes and core classes, I am understanding how the world works and how to be successful in my field," Macioce added. "This class is aimed to prepare us for life after college and it does just that. It also gave me a good wake-up call that financial choices during college matters, too, and that preparing for the future needs to start now. This is one of the most beneficial classes a student can take," said Chase Barron, a junior multimedia major from DuBois Area High School in DuBois, Pa.
Baldoni added: "Because of what I've learned in this class, I now feel confident with my financial future and know the right steps to take. The support I've received as a student at Point Park is something I know I wouldn't have received anywhere else."